Oakville’s Centennial Square was alive with positive vibes on Sunday while men of all ages donned feather boas and pink pumps in support of ending domestic violence. 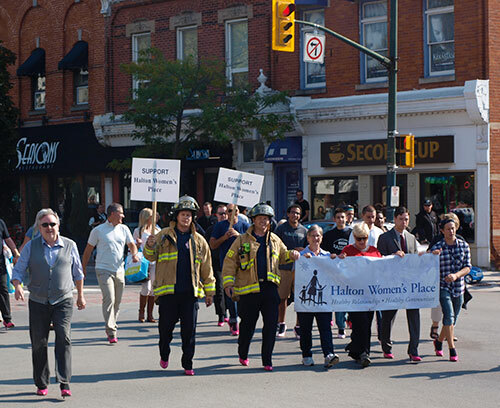 Hope in High Heels, run by Halton Women’s Place encouraged men to walk a mile in a woman’s shoes – literally. Men strapped on heels in either hot pink or a baby pink hue and made the trek from Centennial Square to the corner of Lakeshore Road and George Street and then back. Afterward, a complimentary lunch was served at Paradiso, which sponsored the event. 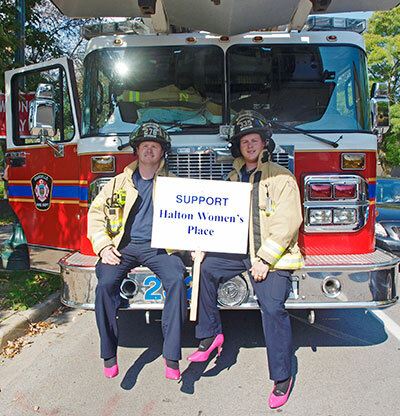 Jody Walker (left) and Ryan Borg (right) of the Oakville Fire Department participated in Hope in High Heels on Sunday morning. Sheridan president Jeff Zabudsky sported a pair of heels while he walked among the supporters. “This an important issue that has as much to do with the impact on individuals as it does with our community,” said Zabudsky. 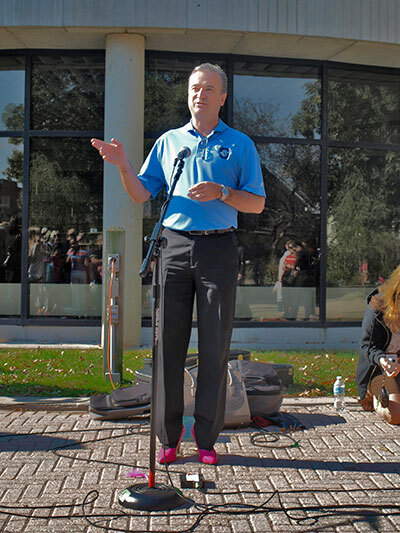 Sheridan president Jeff Zabudsky gave a speech before the event and later participated in his first Hope in High Heels. The consistent message throughout the day was that domestic violence affects more than just the victims. The event also served as a reminder that women’s shelters are a valuable part of any community. Halton Women’s Place serves the entire region with one facility in Milton and another in Burlington. The shelter provides residential and transitional support to women who are fleeing abusive situations. Women and children typically stay at the facilities from six to 10 weeks, depending on their situation. “We are the only women’s shelter in the region, so many women from Oakville will access our shelter or our services in some capacity,” said Bozzo. The walk provides a chance to talk about domestic abuse, and what men can do to prevent it. Nicolette Little is a Hope in High Heels committee member and also teaches communications and literature at Sheridan. Hope in High Heels has been held for four years in Burlington and three years in Oakville. Last year, between the two events, $72,000 was raised, and this year the goal is $80,000. Participants walked up Lakeshore Road from Centennial Square to George Street and back. Added by Renée Lalonde on October 1, 2013.